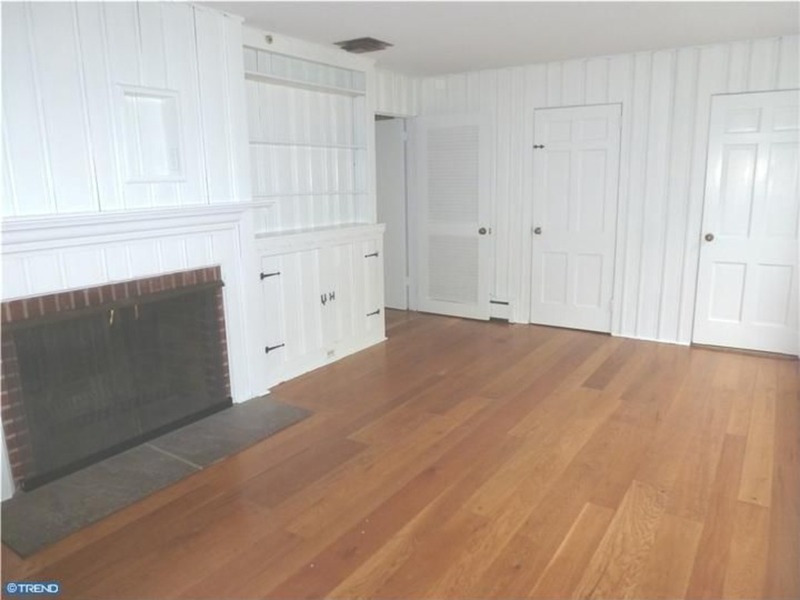 The den is at the back of our home, has lots of light, and has lots of doors because it connects to the foyer, laundry room, kitchen, a half bath and the basement--a lot, right? This room was used by the former owner (a psychiatrist) as a private place to meet clients, so there is acoustical tile on the ceiling and soundproofing around the interior doors which we'll remove. It also has paneled walls, which I'm not going to tear out. In fact, I like them! I want to paint the room a dark blue-gray, specifically, Benjamin Moore's "Gentleman's Gray". And I thought it would be fun to play up the vertical elements in the room (namely the paneling) with striped fabrics. 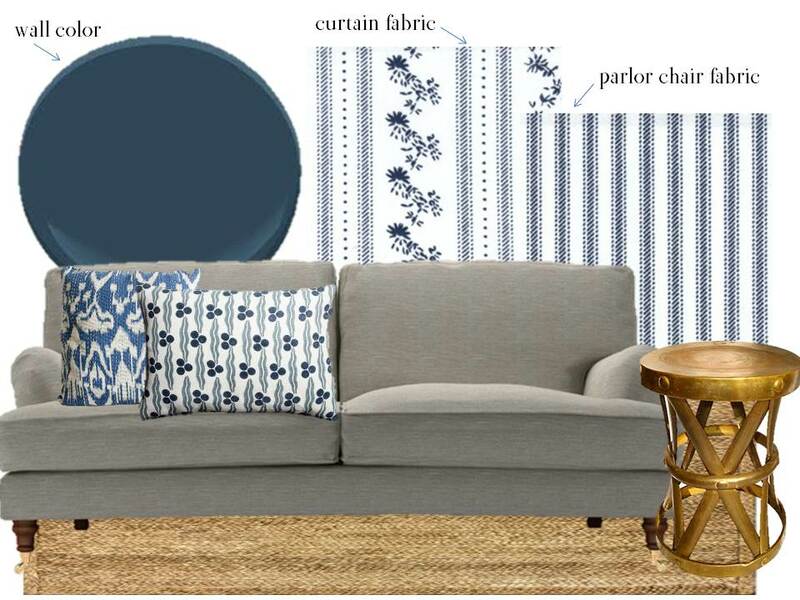 The sofa is an English roll-arm style, and we're still determining the size and fabric we'd like to use. I'll report back once we decide. 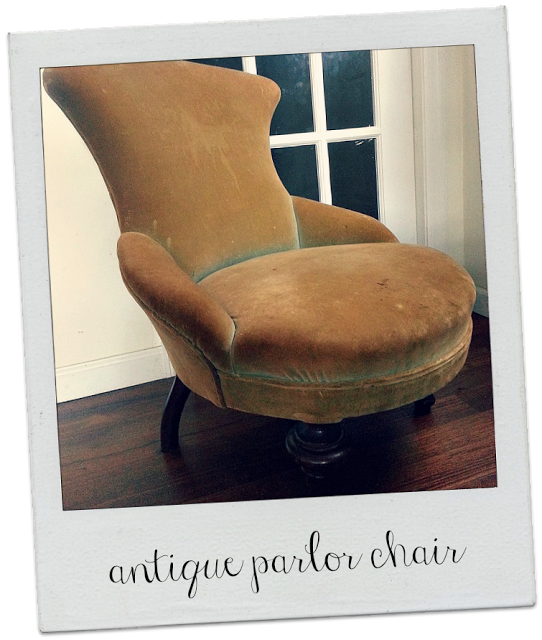 But for now, I know that I want to include the antique parlor chair I bought during the fall and recover it in the navy ticking stripe. The traditional lines of the sofa and parlor chair will be off-set by the brass strap stool that I own, as well as other more modern elements that I'll incorporate. Oh, and true to myself, I'll add some touches of red I'm sure. For now, that's what I've cooked up. What do you think? Plans like this are exciting and get me through the monotony of boxing up everything we own! Oh the plans look beautiful! I'm in love with everything you've chosen, and really can't wait to see that chair recovered! I'm currently getting a chair reupholstered in a ticking stripe but wasnt sure how it would hold up. Are you going with 100% cotton? Are you worried about stains/spills? I've used ticking stripe in another treatment in our current apartment (see: http://meetmeinphiladelphia.blogspot.com/2012/09/newly-revamped-ticking-stripe-skirted.html) and the fabric was a twill-weight that is perfect for upholstery. I would recommend showing the fabric to an upholsterer to make sure they feel it's a good weight for a chair, and then I would check into Scotchguarding the fabric if you're worried about stains. That chair will be SOOOOOO cute in ticking! And I have a never-ending love affair with English roll arms. This is going to be great! Great style, Ashley. Your smart to just focus on the rooms that will get lots of usage now. ANyway, I love the fabrics & the english roll arm you chose. I'm also considering ticking fabric to upholster E's chair in her room. Very exciting...I LOVE that Dutch door, very jealous!! LOVE!! I'm a fan of the paneling too and I'm so glad you are 'going with it'. Can't wait to see more! Oh, this is going to look fabulous!! It's so you, and I'm so excited to see the plan in motion. Yay - I can live vicariously through your project! I am so in love with your new home!! I absolutely adore it and the inside is just perfect. I can see every little piece that you picked out going perfectly in there. It's going to be gorgeous!! Love your thoughts for the walls. Blue paneling will be pretty. Love the sofa too! 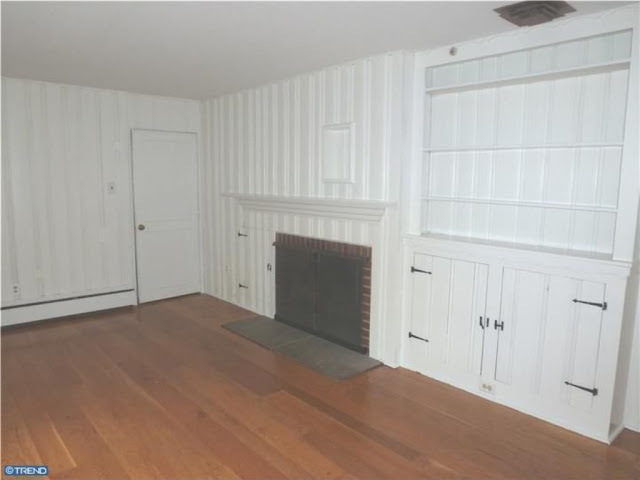 That room already has so much going for it. 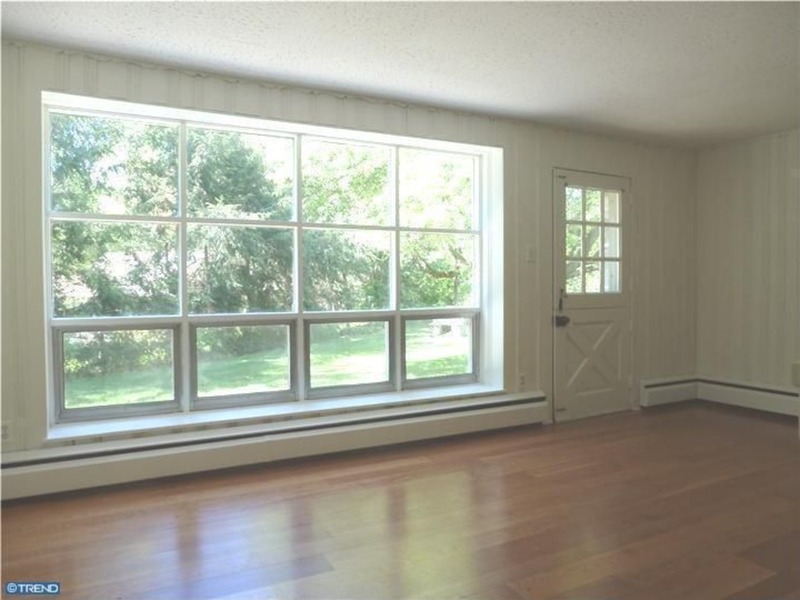 The huge window and a Dutch door? Wow! Love the direction you're going - I think the walls alone will be amazing. Have I mentioned how excited I am for you?!?!?!? such charm! Can't wait to see the process.